I sat down, 35,000ft up in the air, minding my own business in our BA flight to Vienna and OW, what the f. What’s that? Oh god, the toilet seat is cracked and has pinched my bumcheek and made a small cut. Cue our first two hypochondriac days in Vienna where I was convinced I was going to die of MRSA. I didn’t and I lived to tell the tale. Anyway, Vienna: it was our first time here and it’d be wasting time to repeat what every other traveller says: it’s a really lovely city. 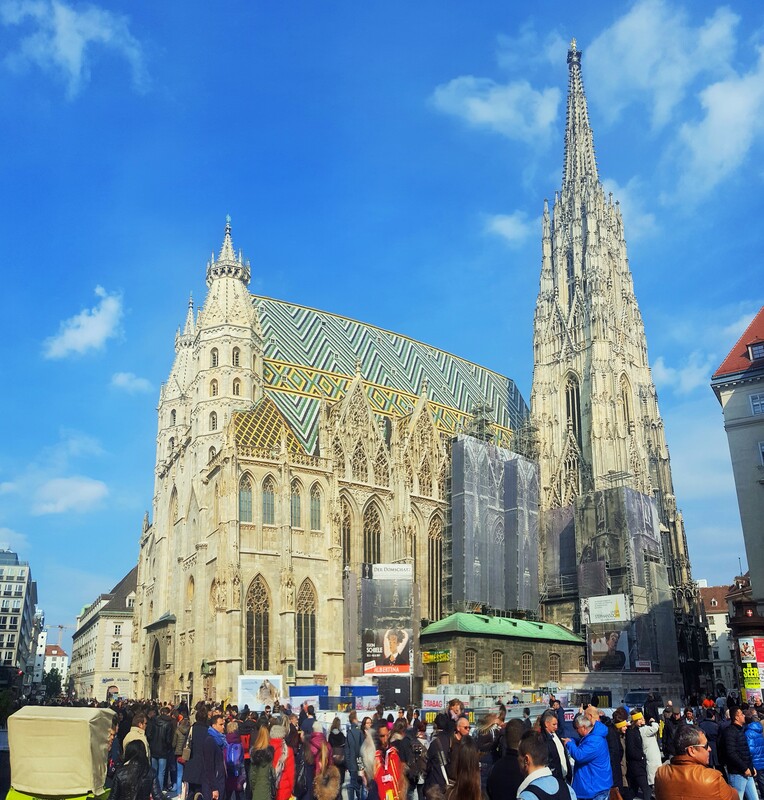 Small enough, beautifully well-kept imperial and baroque buildings, good public transport, lots to see – far more than a 2 day break would allow us to experience. Pippa at the start line! The course is essentially (ish) two kinda loops of the city with the race doubling up on the same route for about 4-5 kilometres. 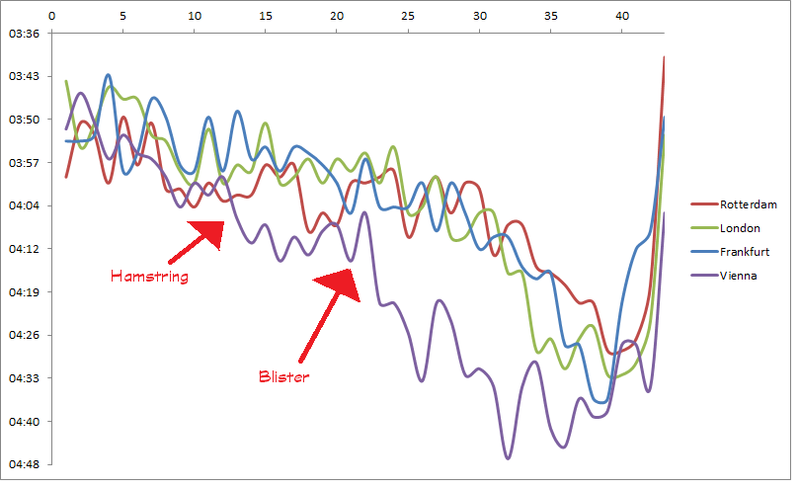 It’s mostly flat though there’s a climb of 0.5 degrees for a good 10km in the middle. 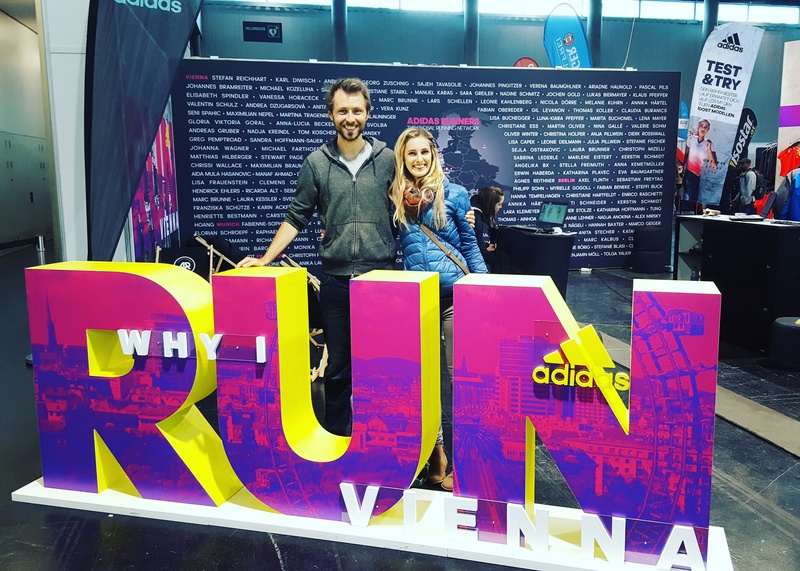 The race starts just across the Danube at the Vienna International Centre, a few tube stops from the city centre. As per every race, I start by complaining about the lack of toilets. This race was only an exception by its genuine lack of toilets. It’s reasonably common to have men darting off behind bushes or peeing behind trees when the queues get too long and the clock is ticking. This, however, was the first time I’ve seen rows of women crouching down next to the portaloos out of desperation. The weather was cloudy and cool (which is ideal) but very blustery with some strong northern winds which chilled us to our bones while waiting for the start and definitely knocked at least 20 minutes off my final time (ahem). 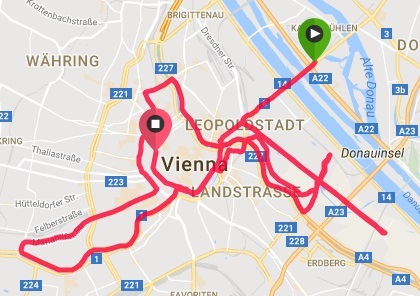 Once the gun went, we crossed the Danube – so far, so good and I paced along whizzing past quite a few runners who were clearly in the wrong starting pens. 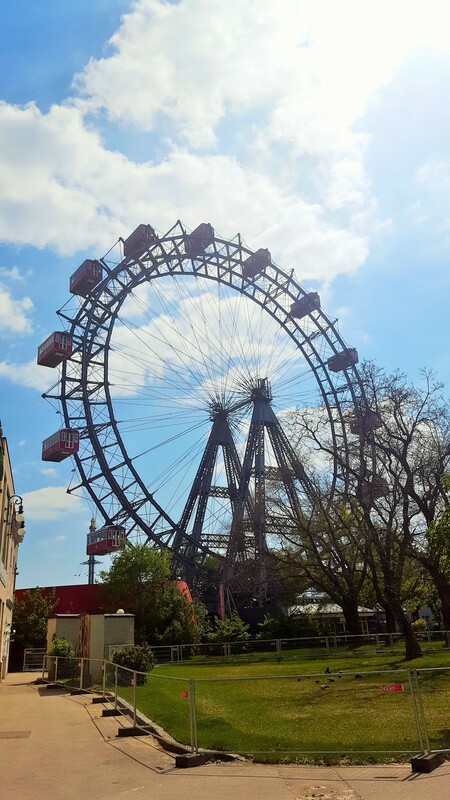 At the famous Rieserrad Ferris wheel, we took a left and went south-eastwards through a calm park. 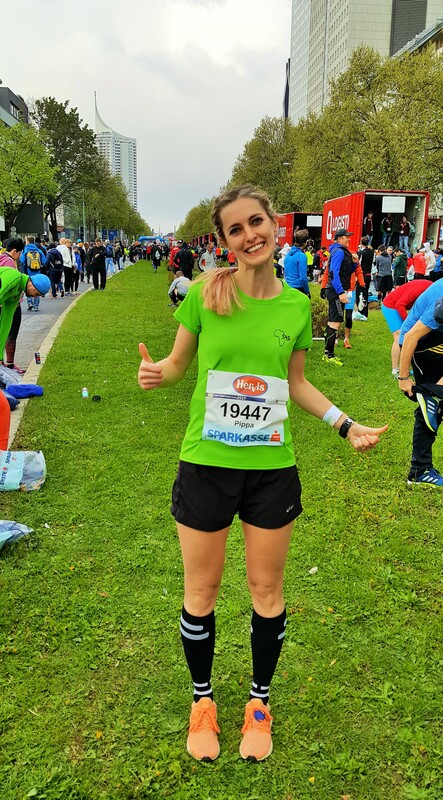 My hamstring was niggling but I was doing alright – the first few kilometres of a marathon don’t always indicate much about how the latter ones will go, it’s mostly about not going out too fast and knackering yourself for later. I went through 5km in 19:19, roughly on target. As we exited the park, we started running back towards town along Vienna’s humongous Donaukanal (Danube canal): at this point in time, essentially a giant wind tunnel in our faces. Practically, it probably had hardly any impact on runners’ times but it was starting to dampen my spirits, especially as I was losing a few seconds here and there, my hamstring injury was flaring, a blister was making my running very uncomfortable and I was replaying some of my super slow recent half marathons in my head and thereby convincing myself that this race was a bit pointless. Worst of all, the organisers say in the race brochure that you can chose to drop out half way and get a half marathon medal. WHY?! 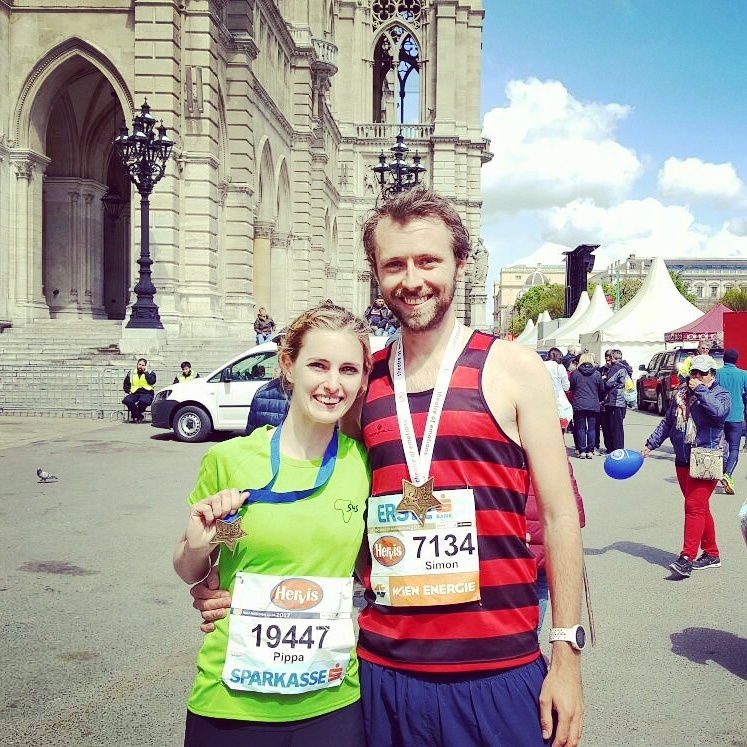 Marathons are exercises in mental and physical strengths: don’t give us a cop out option! I’m still not sure why I decided to turn left and carry on but I did. I think it was the right decision? I regretted it immediately but it was too late to turn back. Maybe I’d just do another few kilometres – it’s more or less a loop anyway so I can just drop out and walk back to the end if need be. Rewinding a few steps, we’d been past the Schonbrunn Palace on the way after 15km: a staggeringly monstrously huge palace which puts Buckingham Palace to shame. One’s a palace; the other’s a stable. The rest was mostly pleasant backstreets with decent support though not much that sticks out. So, I went through the half marathon marker in 1h25 – two minutes behind my target and I was slowing down, a clear sign that PBs were off the card. Two kilometres later, I was stopped in my stride for the first time in 3 years during a race. My blister, which had by now reached the size of a marble, suddenly popped and I felt a big dollop of goo ooze all over my toe. Lovely, I know. I only stopped for a few seconds then decided that I may as well run to the next main bridge and then call it a day. After a few more steps, the pain was (frustratingly?) not much worse than before so I kept going, although my motivation and speed had both plummeted. In my mind, I was trying to work out how long I’d have to keep going before getting the tube back and jogging the last kilometre in order to cross the line and get a half marathon medal but not appear too high up on the marathon rankings and suffer the ignominy of being disqualified for pretending to have run the whole event and cheating. There was a tube station every 500m or so after all, this wouldn’t be too hard to implement. The rest of the race was largely a loop of the same course: the section from 27km to 35km takes you out of town through a sparsely supported park and is traditionally the hardest mental stage. By the time I’d reached 32km – the furthest point as a crow flies from the finish line, I decided I may as well actually make it to the end rather than looking for lazy ways to chicken out. 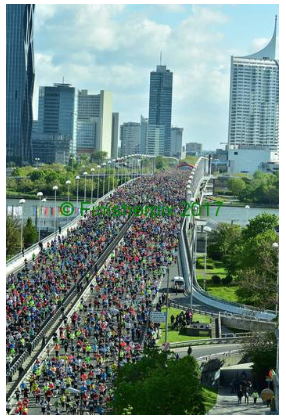 Vienna marathon vs last 3 marathons … not good, not good. 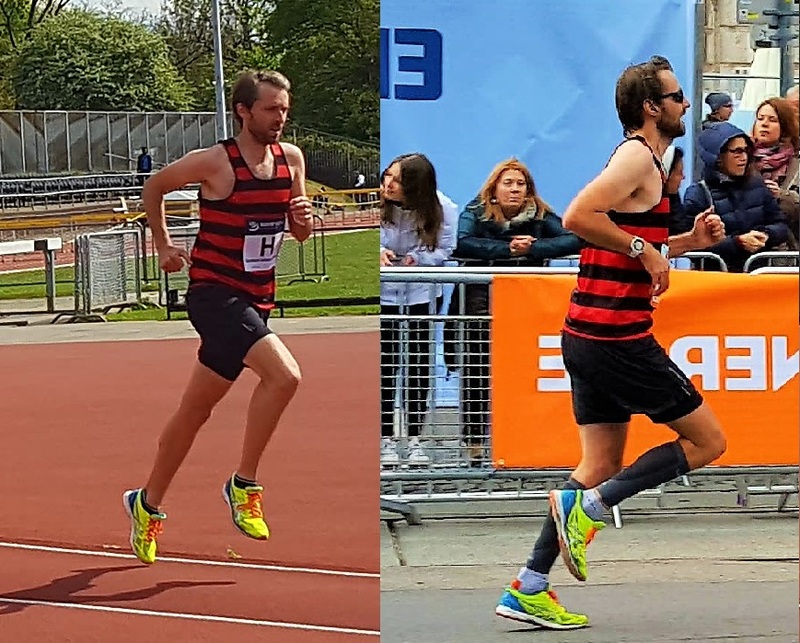 Start of 5k vs end of marathon … identical form! My form, however, was pretty terrible because of both the knackered hamstring and the oozing blister. The photo to the right compares the start of a 5,000m race the week before the marathon and the end of the marathon. I think that’s a sure sign of the body shouting STOP. 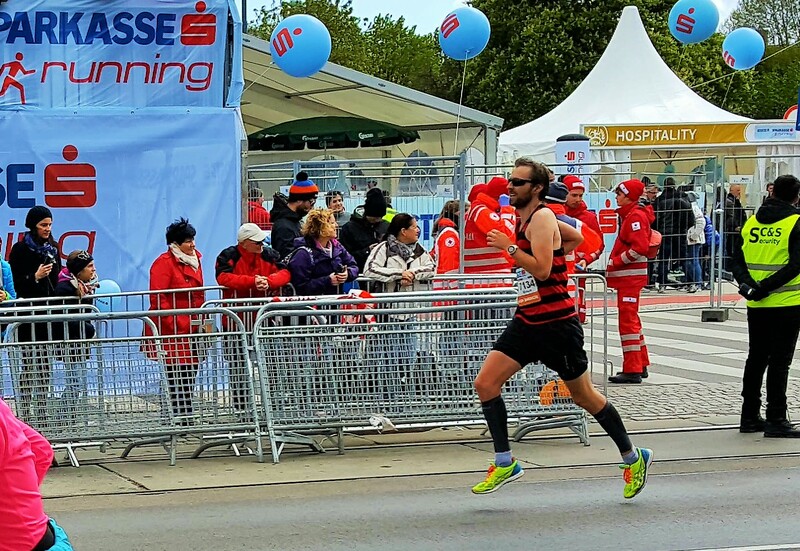 Happily enough for it, the finish line was around the corner – I crossed in 3h02.01 (.00), a little faster than I felt I was going but a poor performance overall. Struggling through the last few hundred meters. FYI: the slow people at the front are finishing the half marathon at the same time!! Although my body was bruised, I jogged through the line without being out of breath: my mind had just given up on my body far too early this time around. Ah well. How much do sports psychologists cost?